Forklift - F.A.S.T. Rescue Inc. The F.A.S.T. 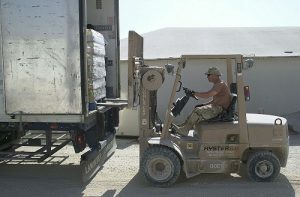 Rescue Forklift Training Program provides workers with the basic knowledge to operate forklifts safely. This course trains operators, both new and experienced, to recognize the causes of lift truck accidents and how they can take preventative measures to avoid such accidents. This course meets CSA B335-04 Standards. Course Content: Understand the responsibilities under OHSA, the potential penalties, stability and tipping, center of gravity, leverage & counterweight, load stability affecting lateral stability, braking and cornering, capacity charts and load center, pre-startup inspections, site hazard assessment, cylinder inspection and qualification, change and leak testing, starting, stopping and parking, safe traveling practices, inclines and ramps, safe load lifting and handling, proper hydraulic operations, picking and placing load techniques, signaler procedures.